Even at the time of summer holidays and public beach, “forgetting” watchmaker Richard Mille has not forgotten his fans. This time the news is likely to be palatable to those who have a passion for the game of poker and the green baize. New wristwatch RM030 are available in two versions – Black Rose, and Black Out. Watch Black Out in black. The contrasting red accents and white arrows on the dials emphasize the black color, making it deeper and more intense. But watch Black Rose, in turn, can boast of “frame” made of pink gold and red pen for the supply of hours. Watches are made on the basis of the mechanisms RMAR1. 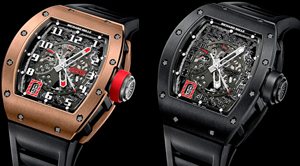 Buy watches will be exclusively in boutiques Richard Mille brand in North and South America. Franck Muller Tourbillon presented the fastest! Overlapping time in the new model HLQ Classic from the watch company Hautlence!